Karissa is a Special Olympics swimmer who is showing people in Elk Grove and elsewhere that disabilities are not debilitating for exceptional people. Karissa was selected from 2.5 million athletes worldwide to receive the award of International Athlete of the Year for her commitment to excellence and sportsmanship. 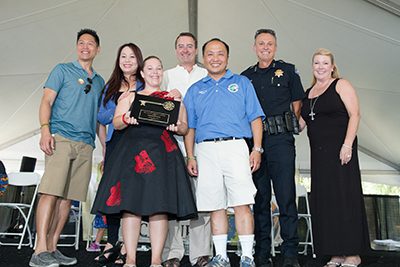 Karissa is the only Northern California Special Olympics athlete to ever receive this honor. Karissa is a graduate of Pleasant Grove High School where she was the first special education student to swim for the varsity team. She is also an entrepreneur, developing a line of competition swimwear specifically designed for individuals 5’2” and under with fuller figures such as the average female with Down Syndrome or other metabolic disorders. Karissa started the foundation called Athletes for Officers in 2013 to help Special Olympic athletes give back to officers in their time of need. Karissa has raised funds to purchase ballistic vests for Police K-9 officers, purchased a new dog for the Stockton Police Department and has even organized a swim-a-thon to raise funds for Roseville Police Officers shot in 2013. Karissa received the California Highway Patrol’s Commissioner’s Medal of Distinction in 2015 for her dedication to assisting law enforcement and is the current Miss Inspirational Ambassador 2017. Karissa has been a volunteer for the Elk Grove Police Department since 2011, contributing more than 1,000 hours of service.